Have you ever been on a snipe hunt?? Well trying to find a Spudnut Donut shop is like trying to find that D****d SNIPE. I knew there were 3 in Panama City, Fl in the past 5 years, and that 2 of them are no longer, the third I went to the address and it was now a strip shopping plaza. Then all of a sudden Granny and I are out on a drive and BAM a spudnut sign, i would have locked up the brakes but there was a huge truck behind me. I went to the door.... OH SH*T they close at noon and here it is 12:05. FOOLED YA.... here you thought I was going to be denied, but just as my heart sank a couple walked out the door and I KNEW it was unlocked. I quickly went in, oh that heavenly aroma, lightheaded I staggered to the counter and placed my order. the back of her shirt "Spudnuts the UPPER crust of Donuts"
I talked to the girl behind the counter and she said they did have a store further up 23rd street, but they lost their lease and moved down to this location. Ahhhhhhhhh That is what happened, I told her about my love for Spudnuts, she just laughed at me. I was so happy to find them still open and still making some of the BEST DONUTS in the world. Hearing about your difficulties finding the Spudnut Shop open, I was thinking maybe Travelin Man wrote this report! Great looking donuts, CK! Are they still made with potatoes? Could you taste the difference? I ran across one in Sacramento a few years ago and theirs tasted like regular donuts. I asked if they really used potatoes but they at least pretended not to understand English (most donut shops in CA are ran by Cambodians). I spoke to the girl behind the counter for awhile and yes this spudnuts still uses potato flour for ALL their donuts. As far as the taste, the donut holes almost melted in your mouth they were so light. The sour cream donut (which is usually heavy) had a dense but still lighter than a regular s c donut. The yeast twist was just like the donut holes, extremely light, and just melted in my mouth. Just wondering if possible during your next SPUDNUT photo shoot if you could get some close-ups! See ya, I'm headin' to the bakery for a freshly made chocolate eclair. You devil, you! You picked the exact same ones I would have. Yum! Even though I can't eat donuts because of their sugar content, I sure can appreciate hearing about this place. It appears that they're doing fine, but it sure is nice that you reported on them, because now others who happen into that easily-accessible area can check them out. Holistically, Ort. Carlton in Make-Me-One-With-Everything Athens, Georgia. WOW! 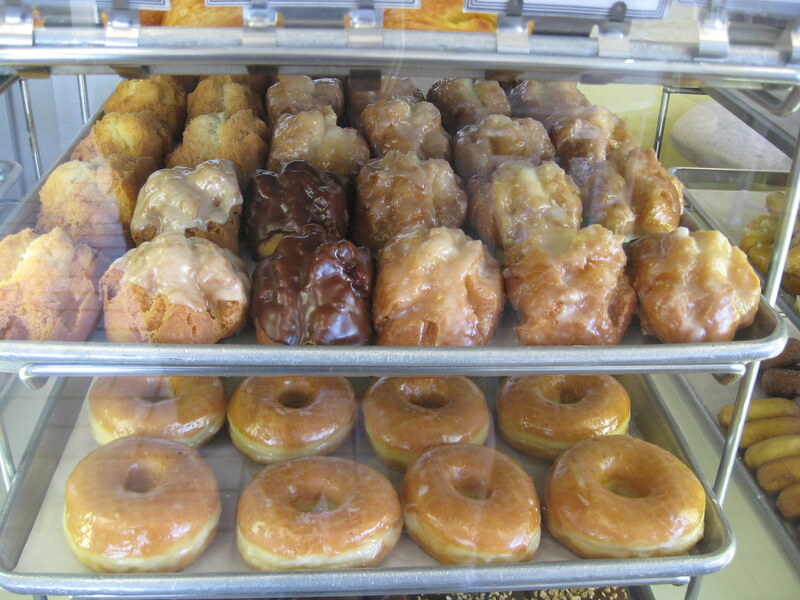 We used to have Spudnuts in Los Angeles. The last time I went to one only one type of donut used the potato flour. It was round with a little handle to hold it... Kind of like the letter Q. Well driving home I thought more on the subject of donuts. I have them regularly. I think my donuts with the little handles must have been from Dunkin Donuts. They're also not around here any more. I know of one in Colorado Springs on Old Colorado City Road. It is also in a strip mall with a Safeway and Pizza Hut. Don't know the exact address. Don , my hubby Paul would and could inhale those beautiful donuts with incredible zeal... But,he's a diabetic and he loves his feet and eyes more than the donuts ! Will make that a planned stop! I think the statute of limitations on blaming me for restaurant misfortunes expires when you find a place that is actually open. TTM - I can be your witness that all stops were open in Chicago! Cajun - I found a Spud Nut in Bradenton Florida last year! Pretty god find! Nice job as always! Looks like you found your way to donut heaven. 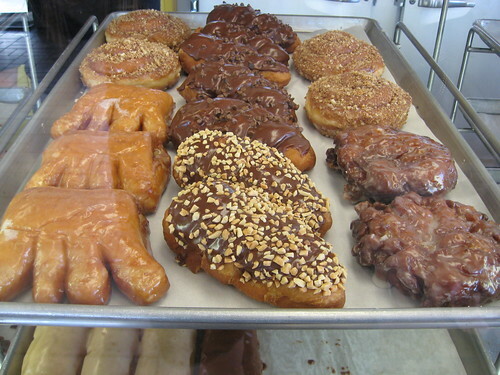 Donut pictures make my toes curl involuntarily. Nice job Donald! I haven't hunted snipe in several years. The last time I did my wife got a double. "WOW! 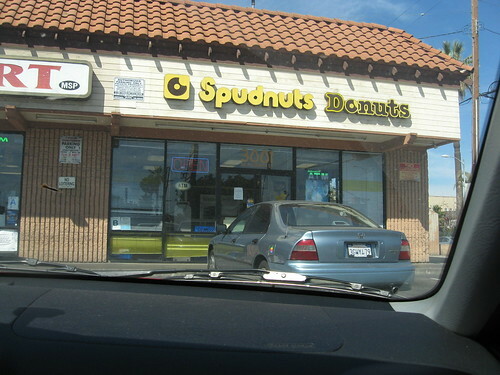 We used to have Spudnuts in Los Angeles. The last time I went to one only one type of donut used the potato flour. It was round with a little handle to hold it... Kind of like the letter Q." There is one off of Sawtelle and Vencie Blvd., and one on Reseda and Devonshire in Northridge. I have also seen a few in So Central. TOO LATE, the phrase has made it into our lexicon and YOU my friend are now infamous. Elise, that's the one... Venice and Sawtelle. I used to live by Venice and Sepulveda. Went there many times. I grew up in a town called Galesburg in Illinois. There was a place called Elmer's Spudnut Shop at the corner of Fremont and Broad streets - in the 1950s and 60s. I had an early morning paper route and the newspaper would drop my papers off at that corner. Elmer would invite me to fold my papers inside his shop (about 5:00 a.m.) when he was busy making those delicious things! And he always let me have a donut or two before leaving to deliver my papers. I left town about 1965 after graduating from high school. I don't know how much longer it lasted as Elmer's. For several years in the 70s it was a donut shop called "Swedough's". Oh Donald, I'm here to make you crazy. So Donald, that location is on Figueroa St. in Los Angeles. I was visiting my mother and she was also having a couple of ladies down from Everett, Wash. who were high school classmates of hers. And it turns out one of the reasons they were visiting LA was to hit an open Spudnuts Donuts, because they had grown up eating them and found all other donuts to 'taste funny' afterward. I was giggling the whole time thinking about you and your quest for Spudnuts. Apparently if you had them as a kid, nothing else will do. This place was pretty funny. They were selling burritos out of the cooler and had a sign on the door advertising their fax services. As you can tell from the front, they also have an ATM. This is very close to Southern Cal, so all that makes sense. you guys are soooooooooooo blessed and lucky! Oh man you are KILLIN me. I am sweet deprived and you post pictures like that. I would give anything to have a spudnut close by. I would even trade our Dunkin Donut and Starbucks.